Hurricane Arthur made landfall in North Carolina yesterday, July 3, leaving some counties without power as winds topped 160 kph (100 mph). Grumbles of “battening down the hatches” and tying down the patio furniture are prolific as the hurricane moves up the east coast, but there are a few people leaving their toys out in the category 2 hurricane. 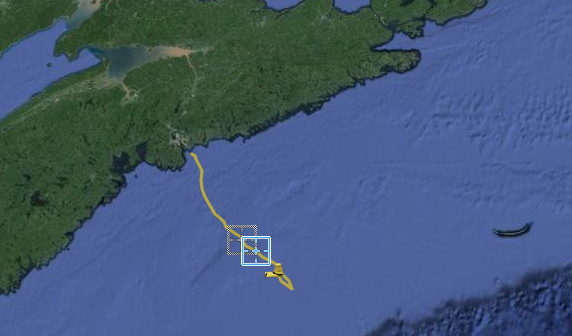 One of OTN’s two Slocum gliders—OTN200—is currently diving 180 kilometres offshore of Nova Scotia in the Emerald Basin. The Basin is the deepest part of the central Scotian Shelf at 291 metres. 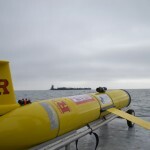 The glider will measure differences in the oceanographic properties near the edge of the Basin before and after the hurricane, diving from the surface to 8 metres off the bottom–depths of roughly 100 metres. Phytoplankton—the base of the marine food web—live in the upper sunlit layer of the ocean feeding off key nutrients in the upper water layers. Storms mix nutrient rich deep water into the upper sunlit layer allowing phytoplankton to feed and grow in an event know as a “phytoplankton bloom“. An increase in phytoplankton means a highly productive area of the ocean, one where marine species will find an abundance of resources until nutrients at this level are dissolved or consumed. 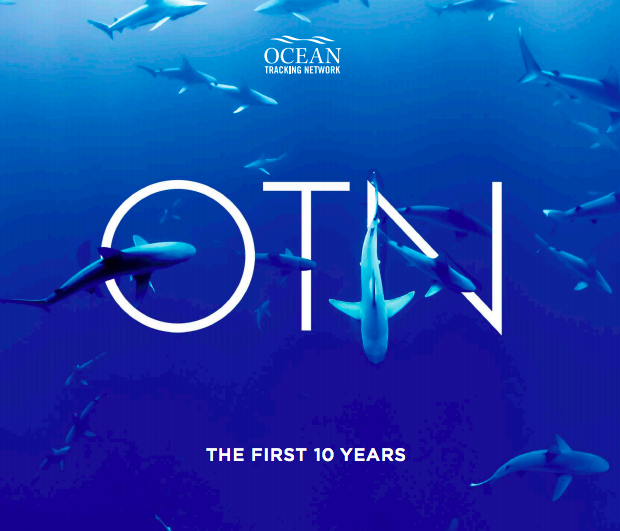 Slocum gliders use a buoyancy drive, moving up and down in a saw-tooth pattern, to achieve depths of up to 1,000 metres (OTN’s gliders reach maximum depths of 200 metres). 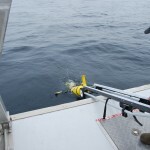 Preprogrammed course tracks and a battery pack mean they can be deployed for a month at a time, taking hi-resolution measurements of ocean physics and chemistry. 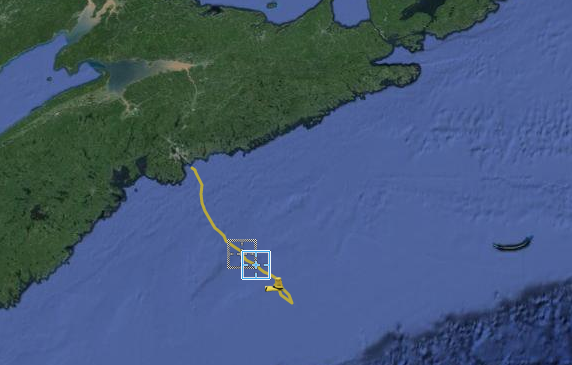 OTN’s Slocum gliders measure conditions along the Halifax Line to provide context for animal movements (why do animals travel where and when they do). More recently, the gliders are being equipped with tracking units to pick up tagged animal detections as they travel. Hurricanes form when air temperature and sea-surface temperature are at an all-time difference. Oceanographers and atmospheric scientists work together to model hurricane behaviour and better predict storm events and their impact on coastal communities. More information is needed as the global ocean temperature increases potentially affecting the seasonal variability of hurricanes. “Gliders can measure the ocean underneath the clouds; satellites can’t. Satellites can be used to measure the sea surface temperature to help environmental forecasts, but only when there are no clouds. The thing about hurricanes is that there are always big clouds around them, so gliders can provide data where we wouldn’t otherwise have any.” – Adam Comeau, glider technician (OTN). The glider data, which are collected in near-realtime via satellite uplink, are publicly available on the Global Telecommunications System (GTS) and the OTN glider website. Last September during hurricane season, OTN participated in the first Gliderpalooza, a simultaneous launch of 13 Slocum gliders across the Atlantic Shelf led by Rutgers University. 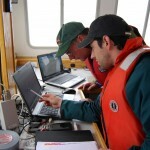 The event mapped a crucial part of the Atlantic Shelf collecting a unique data set for modellers, picked up animal detections including blue sharks, and provided proof of concept for an international glider network. 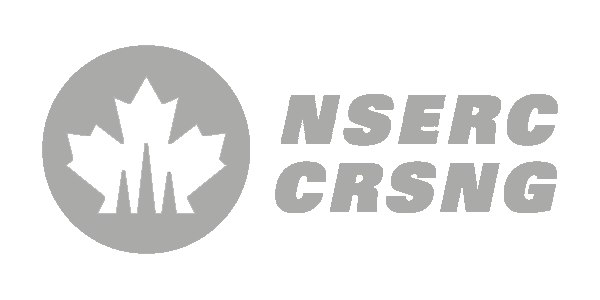 OTN was the only Canadian participant. Plans are shaping up for Gliderpalooza II: Glide Harder set to launch in September. Adam Comeau launches a Slocum glider off the boat deck. Richard Davis and Adam Comeau (front) review glider data.